Bus Rapid Transit may not sound thrilling, but trust us, it is! Want to get excited about BRT?? Just watch this video depicting what bus rapid transit will look like in Fresno. We’re still jazzed from watching it. With a system awaiting approval to be complete in a few years, we need to let our councilpersons know that we support this. Learn more this Thursday, Dec 12th at the 10:30am BRT workshop at City Council. If you can’t make it, email your councilperson and share your support for BRT. Studies show that more and more Americans, especially millennials and retiring baby boomers, value communities that are walkable, bikeable, and with plentiful transit. 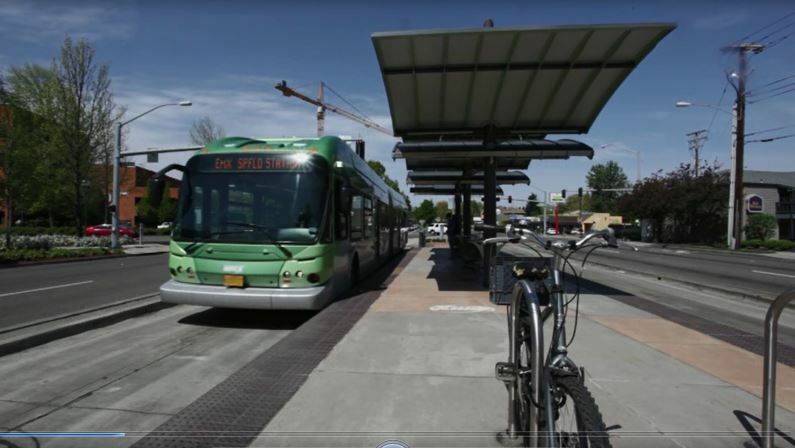 Bus Rapid Transit, or BRT, has many features of light rail, but at a fraction of the cost. BRT has proven to be a model of success in cities throughout the U.S. and the world. For example, the Institute for Transportation Development and Policy cites that the Cleveland BRT is a 7-mile route, which cost a modest $50 million, while spurring nearly $6 billion in development. This project is succeeding in bringing jobs to a once lifeless city center. Cities such as Boston and Chicago are currently working on long-term BRT network plans. What is the City of Fresno doing with BRT? The City of Fresno has received almost $50 million in federal grants to build a bus rapid transit (BRT) system along Blackstone and Kings Canyon, an “L” shape centered on Downtown. This will make it easier for people from throughout Fresno to get downtown and walk to businesses and cultural amenities. And we’re not even being asked to pay for it locally. Fresno’s bus rapid transit system (called the “Q”) will run from River North to South from Park Shopping Center to Downtown and East to West from Ventura to Kings Canyon Road. The system will have buses that arrive every 10-15 minutes; enhanced stations with real-time transit information, lighting, ticket vending machines, canopies and electronic displays; modern, comfortable buses; bicycles allowed on board; and functionally integrated public art at all of the 51 stations along the BRT routes. One amazing component is that buses will have priority at traffic lights via queue jump lanes (check out the video to see how this works). Also, passengers will pay the same fare as a regular FAX bus. For more information, you can read up on Fresno’s Bus rapid transit plans here. BRT also makes it viable to plan and develop transit-oriented housing — not just downtown, but along the corridors too. This has major implications for the way Fresno develops, and how many miles we all put on the road. That, it turns out, has a big impact on the City’s draft Downtown Plans and updated General Plan. Our city and the region as a whole cannot meet the emissions targets set by state and federal standards for future transportation funding without BRT. In other words, stopping the project could cost our Valley dearly. If any of this matters to you, you might want to let City Council Members know. If you’d like to hear more in person, the Council will hold a workshop at 10:30 a.m. at their December 12 meeting about the project. Public comment is not typically part of such workshops, but you’ll be able to see the same information Council Members do. The BRT workshop will be at 10:30am this Thursday. Click here for this week’s council agenda.